An Act to provide for the establishment of the engineering council, Sri Lanka which shall be responsible for the maintenance of professional standards and conduct of engineering practitioners; registration of different categories of engineering practitioners; and to provide for matters connected therewith or incidental there to. An Act to provide for revocation of irrevocable deeds of gift on the ground of gross ingratitude and for matters connected therewith and incidental thereto. An Act to make special provisions to exempt internally displaced persons from certain requirements of the Registration of Electors Act; and to provide for matters connected therewith or incidental thereto. An Act to provide for the promotion and regulation of foreign exchange; to vest the responsibility for promoting and regulating foreign exchange in the central bank as the agent of the government; to provide for the repeal of the Exchange Control Act; and to provide formatters connected therewith or incidental thereto. 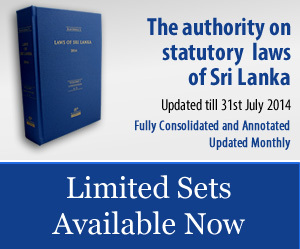 An Act to provide for the establishment of the Ceylon German Technical Training Institute; to specify the powers, duties and functions of the institute; and for matters connected therewith or incidental thereto. An Act to provide for the development and implementation of a National Policy and Strategy on Sustainable Development in Sri Lanka; for the establishment of a Sustainable Development Council and for matters connected therewith or incidental thereto. An Act to provide the imposition of income tax. An Act to provide for calling of fresh nominations and the holding of elections in respect of two Pradeshiya Sabhas in the northern province where elections to such Sabhas have been postponed due to unforeseen and urgent circumstances; and to provide for matters connected therewith or incidental thereto. 20. ASSISTANCE TO AND PROTECTION OF VICTIMS OF CRIME AND WITNESSES (AMENDMENT) ACT, NO. 27 OF 2017. 21. PREVENTION OF CRIMES(AMENDMENT) ACT, NO. 29 OF 2017. 22. LOCAL AUTHORITIES ELECTIONS (AMENDMENT) ACT, NO. 31 OF 2017.